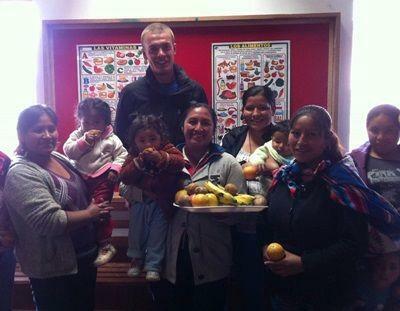 The following article was written by Andrew Bruton, Communications Officer in Peru. Peru is one of the world’s largest producers of copper and silver, which should make it a rich nation. However, despite reducing poverty by almost 28% in the last decade, the poor management of its economy means that inequality and poverty are rife. Consequently, malnutrition is a problem that the country is faced with and the struggle to put food on the table is most families’ greatest concern. As a result, many families have left the rural areas to live in rapidly expanding towns. However, this migration is not necessarily synonymous with a better life. In towns like Urubamba, where our Nutrition Project is based, if the man doesn’t earn enough, it falls on the women to make ends meet. Many women struggle and work long hours to make enough to get by. This difficult situation leads to inevitable choices; they will buy rice, pasta and potatoes to feed their family. However, the nutritional value of such meals is extremely low. Malnutrition creeps up on families and it’s hard for these mothers to see the benefits of making healthy eating choices when their economic situation is restricted. At our Nutrition Project , volunteers and project partners make it their priority to educate groups of mothers who wish to provide better meals for their families. Important information about the food groups and a balanced diet are relayed, with the message being reinforced by games based on what they have learnt. During the course of these presentations, our volunteers also prepare food based on the information they have shared. As well as being a free meal for the local women to enjoy, this demonstration of what is possible within their means helps to motivate them to prepare the same. Finding solutions such as these to tackle health issues in Peru are a way in which we can play a small but vital part in educating people and improving lives in our global community. On World Hunger Day, let’s make it our aim to help others live healthier lives and share the abundance of what we have. Spread the word by tweeting #worldhungerday or @WorldHungerDay.